The school year is about to end (gasp! that went by so fast!) and it's again time to start looking into productive summer activities for the kids. The reminder came from a comment on my post from last year, asking if those classes are available this year; the answer is that I don't know yet. I'll get a new post together, or perhaps update that one. They usually start rolling out final schedules by March, so we should find out soon enough. 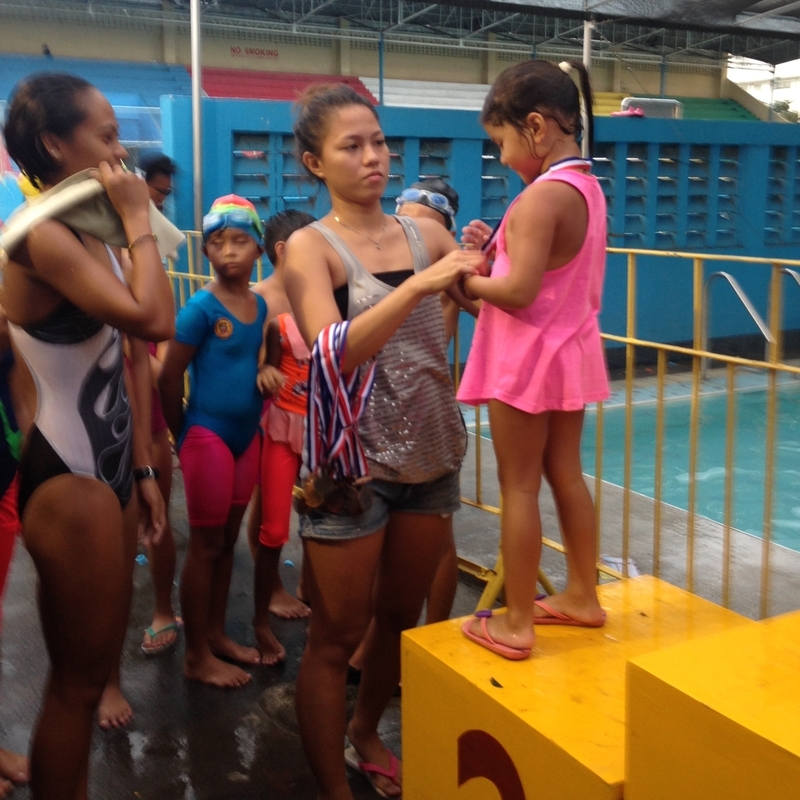 So in the end, our 5-year-old daughter, S, did swimming and Taekwondo at the Cebu City Sports Complex. In this post, I will only review the swimming course; I will write another one for Taekwondo. The decision was not based purely on convenience, it really had more to do with the atmosphere of the whole sports complex itself. There you'll see people of all ages doing different types and levels of sports: teenage girls on the obstacle course, young men on the track, middle-aged people doing laps in the pool, young children doing dancesport rehearsals - you get the picture. We had no idea what sports would click with the kids and we wanted them to be surrounded and inspired by all these. We suspect that we are always more excited about it than the kids, but hey, a parent's got to try, right? Because S was only 5, she had to enroll in one of their special, one-on-one classes. The cost was Php 2,200 for 10 sessions, each session lasted one hour. Special classes were scheduled daily and the times were agreed between the student and instructor. Group classes were more rigid with time schedules. One has to have appropriate swimming attire to be allowed in the pool and the lifeguards are pretty strict about it; males need to be in swimming trunks, females in swimsuits, and everyone must wear swimming caps. Goggles are recommended but not required, so apart from swimming costumes, that was our only other purchase for the class. All other equipment were provided. Caveat: While all the instructors seemed fairly good swimmers by themselves, I cannot speak much about how each handled their classes. Our kids were only ever taught by Rue, so please keep this in mind about my review, as your own experience may vary. The first order of business was setting the rules: S was only allowed two absences and tardies, after that, Rue reserved the right to cancel the class. At 8 every morning, S must turn up at the pool in her proper attire. They would then warm up, shower and get in the pool, usually in a spot where we could not be seen because S would get distracted at the sight of any parent. To observe how she was doing, we'd usually try to find spot where we would not be noticed observing (the reason for the poor quality of the video below). Rue would usually tell us at the end of the class what their lesson was, and how S did. We usually had the chance to see for ourselves in the pool at home; we didn't mind this too much. If for whatever reason you would like to observe how your child is doing, try bringing this up with the instructor and they will likely be able to find a way to get you on those bleachers so you can watch. Here's S doing the front crawl, her instructor Rue in the white cap is right by her. They would do a certain stroke for a session or two. The advantage of one-on-one classes is that the lessons are paced based on your child's progress; whereas with a group class, the instructor might move on to a different stroke before your child reaches your desired competency. Keep in mind that a course only lasts 2 weeks, so be fair in your expectations. We decided to enroll S for another 2 weeks since we were satisfied with the first two and there was plenty of the summer left. In the four weeks with Rue, they covered front crawl, dog paddle, and breast stroke. We recommend a full month duration vs. 2 weeks, especially if it's your child's first swimming course. Two weeks just doesn't seem sufficient to get to 'confident swimmer' level. Even if your child is talented and learns quickly, given the course is affordable enough, it's good to have them in the water for that longer, guided duration (vs. you committing to take them to the pool to practice by themselves everyday). Culminating activity: swimming competition. S is on the first lane. Ignore side comments from Dad. If you decide to enter your child in future runs of this competition, be prepared to spend the entire afternoon to early evening at the sports complex. They did about 6 strokes for 5 age groups with males and females having a separate go for each, multiply that with prep time plus swim time - you do the math. They scheduled it for a Sunday, too, and we'd made arrangements for 3 pm that day; of course, we never made it to those appointments. Still, we highly recommend letting your child join. We had a good time and it was a great experience for S, she loved her medals and perhaps it helped to add another facet of fun to swimming. It was a good experience overall. Our 10- and 12-year-olds got back to Cebu beyond the dates of the program, so we enrolled them in private lessons with Rue. It is generally prescribed to enroll under some form of ongoing program by the Sports Complex, but we chose the more expensive private lesson route so we could be flexible with venue and schedules. 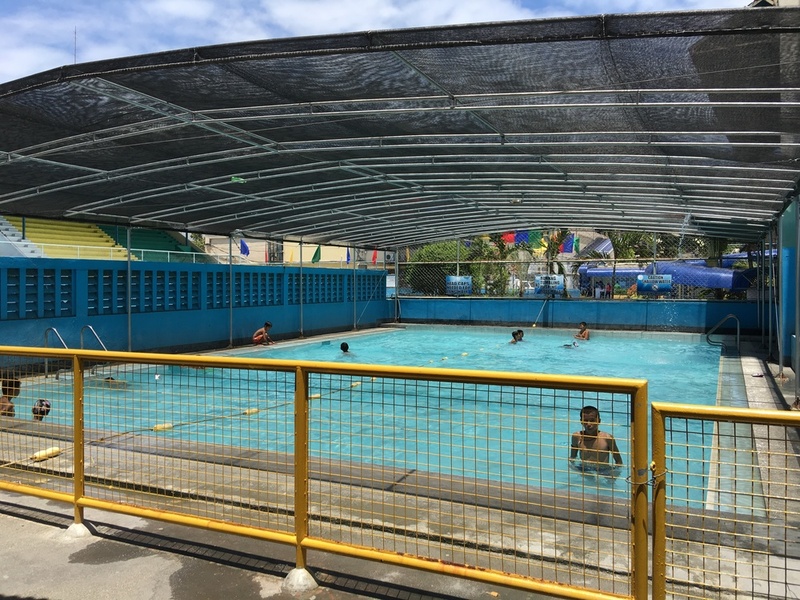 If you do this, keep in mind that private lessons are personal contracts between you and the instructor, which means that the Cebu City Sports Complex is free of any liability from any untoward incidents during the course of the lessons. Best time for the pool: 8-10 AM. Any earlier might be too cold for kids, any later and sunblock is not optional.